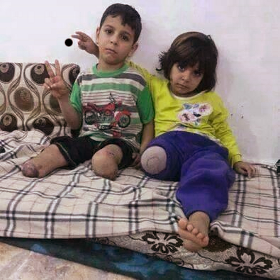 Limbless in Gaza. Guess who caused that? A truthful follower of Jesus – Issa in Arabic, sent a further donation for poor families in Gaza. I have just finished the task by distributing the money to three poor families with disabilities from the Zionist attacks against our own people. Actually it was not easy to find a poor family with an injured child as the last aggression left children without any kind of life. It was meant by the enemy to kill children in particular. Anyway I found three people, two men with leg amputations and a child with an injury from birth. Islam Shawqi Elaraj: a seven years old and living in Gaza. She was at her Mum's womb when the Zionists bombed Gaza with phosphorus bombs. As a result the baby girl was born with many problems in her legs, hips and joints. Unable to walk at all at the beginning. She underwent many surgeries in Gaza and in the Palestine of 1948. She can walk but too slowly and with difficulty. Her family use a wheel chair so that she can go to school as shown in the photos. She has also a problem in the spinal cord at the level of her back; she leans back when walking. Her Mum said that she was under great stress when she gave birth to her baby as she lost many of her family (Elsamoony family in 2008 aggression) Her father is jobless and not educated. They are by the way Gazans ie not refugees from their own land – Palestine. Fadi Elarja: A farmer, 32 years old, and father of six children. Living nearby the destroyed airport in Rafah. During the last bombardment and invasion, he was about to leave his home to tell his father 'lets get out because the bombing is continuous in our area.' But his dad said to him 'let us wait till the morning.' He prayed the dawn prayer and went to see his father. Then suddenly a drone fired a missile directly towards his body. He immediately lost his legs. He was also wounded in the chest, abdomen, hands and his eyes. He was was very severely injured and the paramedics thought first that Fadi was dead, due to the critical wounds and ongoing bleeding. All the family members were wounded in this same attack but not critically as Fadi had been. They spent some time in the European hospital in Khanyounis and they were then sent immediately to Egypt for treatment. He is keen to travel abroad to Germany or Turkey to get artificial legs. He moves now from place to place with a wheelchair. According to him, because he has no political affiliation to any Palestinian political party, he is finding it too difficult to coordinate and travel abroad. Some of his friends have made it and they return back with artificial legs. Ahmed Elshaer is a 22 year old student at the Islamic University of Gaza. His right leg was lost in one of the many 'Israeli' breaches of the 'ceasefire'. This loss was caused by a gun shot near the Rafah beach, about seven months ago. Like Fadi, he is also desperate to travel abroad to get an artificial leg so that he can continue his normal life. He is not married as yet. Details were limited.